Slogan: the magic of LED joins forces This Marc Sadler lamp is finely finished and manufactured, and once and for all eliminates any prejudice concerning the presumed coldness of LED lights. The faceted transparent module combines a taste for Murano glass with the very latest polymer machining techniques. 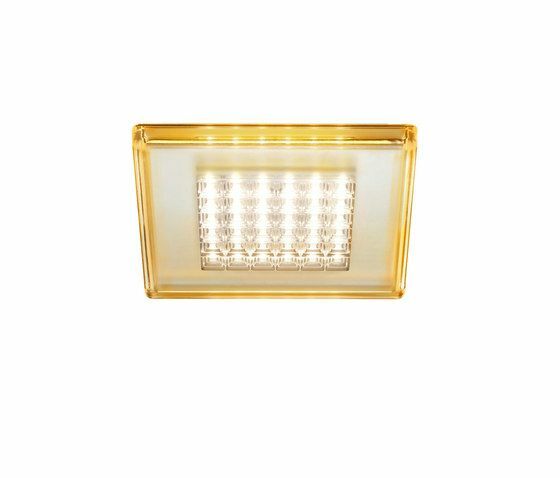 This light has been designed for easy installation, whether recessed or wall/ceiling mounted. It also provides top energy-saving performance thanks to 36 LED lights with excellent luminous efficacy and a consumption of just 15W. Any colour touches around the edges do not change the intensity and quality of the light, which remains warm and enveloping. Quadriled is available in recessed version with polished aluminium structure and in ceiling version with visible grey-painted structure. The polycarbonate diffuser is available in four different colours: clear, with amber profiles, red or blue.